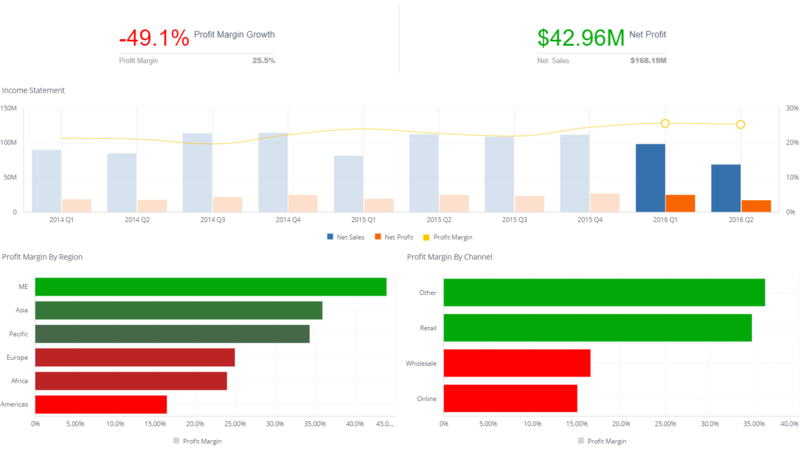 Net profit margin dashboard, showing profit as a percentage of revenue. Like gross profit / gross profit margin, your net income (also called net profit) and your net profit margin show you how much is left after you subtract your expenses from your revenue. The difference is that, while gross profit only takes into account direct costs, net income includes all other costs, including interest, taxes, depreciation and so on. Gross profit gives you an excellent indication of how you’re doing, but to be absolutely sure you understand the health of your business – especially when things are tight or cashflow is interrupted – you need figures that tell you the whole story, incorporating every expense. To procure these fully accurate figures, you need to take all your outgoings into consideration. That includes indirect costs, too. In fact, when it comes to finance, the net profit margin is probably the most carefully tracked KPI of all. 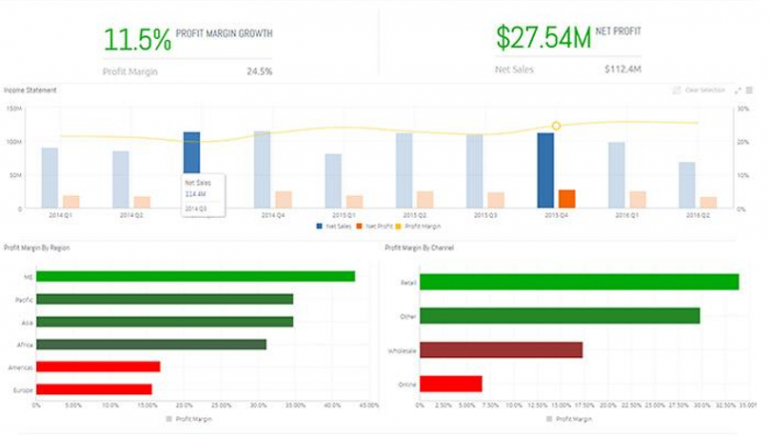 That’s because it’s the definitive answer to the question, “how good are we at turning revenue into profit?” More than the absolute number shown by net profit, the percentage net profit margin is commonly used to assess competing companies, to figure out how effective they are and how much potential they have to grow. Your net profit measures the true profit remaining after you’ve subtracted all your operating expenses, taxes, interest and depreciation. Your net profit margin takes this figure and divides it by net revenue, to give a percentage. I.e. the calculation used is net income / net sales revenue x 100. The data sources used for this calculation are more or less the same as for gross profit / gross profit margin. Those may include SalesForce, your TMS/ERP, accounting software, etc. However, more of this information will be used when working out net income / net profit margin. A huge player in your field is scoping out promising startups like yours for a potential acquisition, and you’re competing against a larger business. Based on gross profits alone, they look like the better option: after all, they bring in more money overall than you do each year. However, when you calculate your net profit margin, you realize yours is substantially higher. You’re achieving far more impressive results with the resources you currently have. Now, you’re set to demonstrate to the investor that if they choose you, the cash injection means you’ll be able to scale up, ultimately delivering a far stronger return for them - thanks to your larger net profit margin. While an increase in net income (i.e. the absolute number) is great, the most important indicator here is to increase your net profit margin, meaning you maximize how much money you keep from each dollar you earn.